The proposed rules would apply to all federally-regulated industries. 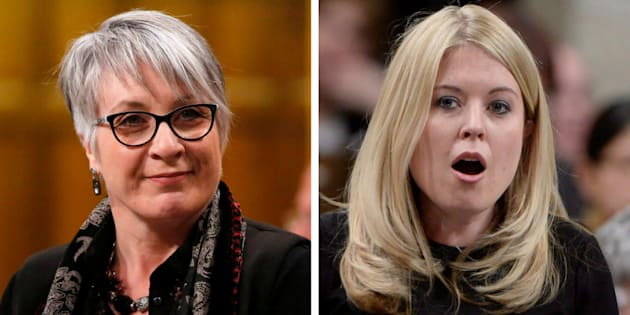 Employment Minister Patty Hajdu, left, and Conservative MP Michelle Rempel, right, both spoke about sexist workplace cultures in the House of Commons on Monday. OTTAWA — There is nothing new about sexual harassment on Parliament Hill, says Employment Minister Patty Hajdu, but it is time to get serious about supporting its victims and stopping it from happening in the first place. "We talk a lot about getting women into politics and if we can't actually protect the women staffers in our own workplaces, we have a long ways to go,'' the Liberal minister said Monday after she opened the debate on proposed legislation to support safe federal workplaces. The legislation, introduced last fall, is aimed at giving workers and employers a clear course of action to better deal with allegations of bullying, harassment and sexual misconduct. Patty Hajdu speaks to reporters at a Liberal cabinet retreat in Calgary on Jan. 23, 2017. Later Monday, MPs agreed with a motion tabled by NDP House leader Ruth Ellen Brosseau to fast-track the legislation, known as Bill C-65, sending it straight to the House of Commons human resources committee for further study. The proposed changes would merge separate labour standards for sexual harassment and violence, subjecting them to the same scrutiny and dispute resolution process, which could mean bringing in an outside investigator to review allegations. The proposed rules, which also apply to banks, transportation, telecommunications and other federally regulated industries, would enforce strict privacy rules to protect victims of harassment or violence. Once passed, the legislation would also allow anyone unhappy with how a dispute is being handled to complain to the labour minister, who could step in to investigate and order sanctions for employers. The new rules would also — for the first time — bring parliamentary staff under the protection of the Canada Labour Code. Staffers would also have access to a neutral third party to examine their complaints, so that they are not forced to rely upon the MP or senator who employs them, especially if that person is also the alleged abuser. That aspect of the legislation has taken on increased significance as the #MeToo movement has reached Parliament Hill, including allegations against Liberal MP Kent Hehr, who resigned from cabinet last week pending an investigation. Last week also saw Patrick Brown step down as leader of the Ontario Progressive Conservatives, months ahead of a provincial election, following a CTV News report that included an allegation of sexual misconduct stemming from his time as a Conservative MP. Rick Dykstra, former president of the Ontario PC Party, arrives for a meeting to pick an interim leader to lead them into the June provincial election at Queen's Park in Toronto on Jan. 26, 2018. And then Monday, a report by Maclean's magazine said the federal Conservative party was aware of an allegation of sexual assault against former Ontario MP Rick Dykstra, yet allowed him to remain on the ballot in the 2015 campaign. Dykstra, who left his post as president of the Ontario Progressive Conservatives over the weekend, has not returned a request for comment. The Liberals asked the opposition parties for the debate on Bill C-65 last week, before the allegations against Brown came to light. "It's a culture where people who are victims of harassment or sexual violence do not feel safe to bring those complaints forward,'' Hajdu said Monday in the House of Commons. Conservative MP Michelle Rempel responded with an impassioned speech on how what life can be like for women on the Hill, where many influential people, often with big egos, work long hours with others in precarious positions. She added that "for all the talk of feminism,'' women at all levels are still used as "photo op props'' and remain vulnerable to abuse. She said women are shamed for standing up for themselves as well as for choosing to stay silent. Rempel urged everyone who witnesses harassment to speak up, rather than forcing victims to do it themselves. "We cannot be bystanders any longer,'' she said, calling on the government to require everyone — from volunteers and interns to MPs and ministers — to take training on how to prevent sexual harassment from happening in the first place.